Setting new trends in the area of fine compression stockings, the Juzo Attractive Class 1 Eternal Green Compression Tights with Open Toe can be distinguished from the standard fare by its especially fine knit. Offering a stylish transparency comparable to any fine stocking, there is as much fashion as function about Juzo's Attractive Range. stocking perfectly suited for everyday use or for special occasions and is a versatile addition to your wardrobe. CE Mark: Juzo compression fabrics fulfill all the requirements of the Medical Products Act and European Council Directive 93/42/EEC meeting safety standards. ISO certification: Juzo implemented its general quality management system back in 1998, and was one of the first companies in this industry to be certified to these high standards so you can be certain you are buying the best quality. Quality Seal RAL: All medical compression stockings from Juzo comply with the relevant RAL standard, ensuring they are safe and effective to use. Oeko-Tex Standard 100: This globally-standardized and independent testing and certification system has certified Juzo as a manufacturer of user and environmentally friendly products, surpassing the existing standards of national legislation. 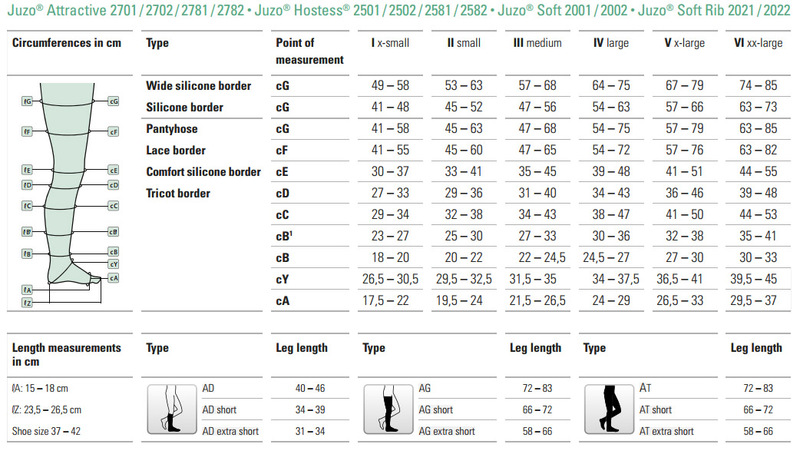 Click the image below to view Juzo's sizing chart for the Attractive range. Compression stockings from the finest brands in the world. Do you have a question about this product or want to purchase it? No problem at all. You can email us with your question by using the form below. A member of our Customer Care Team will respond to your enquiry personally as soon as he or she can. 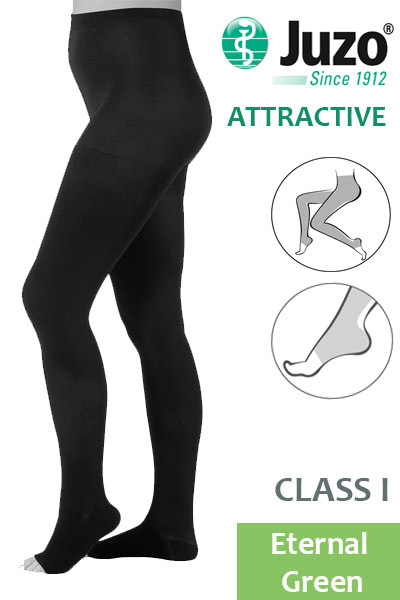 Juzo Attractive Class 1 Eternal Green Compression Tights with Open Toe are non-returnable and non-refundable on grounds of hygiene. Please note, Compression Stockings.co.uk is dedicated to maintaining the highest levels of hygiene for all of its products and for this reason this item is non-refundable and non-returnable if unsuitable or unwanted on grounds of hygiene. The only exception to this is if products are returned within 14 days and are unopened and unworn in their original packaging. If you have any questions regarding this returns policy, please contact our Customer Care Team on 020 7501 1109 or via the "Contact" page for further information. Juzo Attractive products are also suitable for use in travelling, including for long flights and car journeys, encouraging circulation to reduce discomfort. It is imperative that you always check with a medical professional before purchasing compression stockings and it is your doctor who should recommend which level of compression is right for your needs. To find the necessary size of Juzo Attractive Tights, please refer to the chart below. Measure the circumference of your legs at the indicated points and find the size that is best suited for you. If your sizing is inconsistent with a single size, we would advise you to choose the largest size to ensure that your stockings are comfortable and have an appropriate size. Please be aware that Juzo Attractive Tights are available in two lengths: short and regular. To ascertain which size is best suited for your needs, measure your leg from the end of your toe to roughly the top of your thigh and refer to the information below. If you fall on a sizing boundary, we would suggest that you select the "Normal" length for greater comfort. We deliver our products by 1st Class Royal Mail, Parcel Force and DPD couriers depending upon order value and size to ensure that you receive your order as quickly as possible. To see our current delivery times for this product please take a look at the product availability message that appears below the product price and add to basket button.